Israel is a very centralized country. It wasn’t too long ago that there was one government-run television station and the country stood still at 9:00 pm to watch the news each evening. Anyone who has visited Israel will remember the beep-beep-beep coming from the radio every hour on the hour before the headlines are read. However the country has changed and so has our communication. The news spread through social media and cellphones. Television, newspapers and even radio appear to be outdated. Community centers and synagogues were notified and then they sent out emails to their mailing lists quoting the message disseminated by the Ministry of Health. Online news sites broadcast the message as well. By the time children came home from school with the announcement, most residents already had heard the news that south-eastern Jerusalem’s water had been contaminated with sewage and was not potable. The last message to reach me was from the U.S. Embassy which was shared on Facebook. Earlier this year, during the snowstorm that battered the city, we were without electricity. Now for 24 hours we could not use our water. After receiving complaints from residents, Hagihon, the capital’s municipal water corporation, tested the city’s water and concluded that treated wastewater had leaked at a “high level” into the drinking water of several neighborhoods. This happened in the period between Yom HaShoah (Holocaust Remembrance Day) and Yom HaZikron (Israeli Memorial Day) transitioning into Yom HaAtzmaut (Israeli Independence Day). There is a new tradition in Israel to call these days the 10 Days of Thanks (Aseret Yomei Todah). This is to parallel the 10 Days between Rosh HaShanah and Yom Kippur, the 10 Days of Repentance (Aseret Yomei Teshuvah). Not having water during these days forced me to appreciate every other day of my life when I had an unlimited supply of clean drinking water. While I am aware that there are about 80 million people today who do not have clean drinking water, to put it bluntly, I’ve never been one of them. I am not apathetic. As a matter of fact, a few years ago I organized a Jerusalem fundraiser for Charity: Water as part of Twestival, an international effort organized in 200 cities through Twitter. However, I was especially touched having this crisis happen between Yom HaShoah, when we remember the starvation, the thirst and the exposure which killed so many Jews a generation before I was born, and Yom HaZikron, when we remember the hardships of establishing the State of Israel including Jerusalem’s well-known water rationing. My apartment building was built in 1969 in the wake of the Six Day War. It is on the 1967 border between Israel and the pre-1967 No-Man’s-Land. Up until a few years ago there was a room in the basement of our building filled with water. Like the cisterns of ancient Israel, this was to store water in case there was none. Several years ago, we dried it out and renovated it into a storeroom. Especially in Jerusalem, our history is never far behind us, yet as the world becomes increasingly fast-paced, it is easy to forget and to take for granted the basic necessities of life. This year we received the message loud and clear – water and electricity are not to be taken for granted. 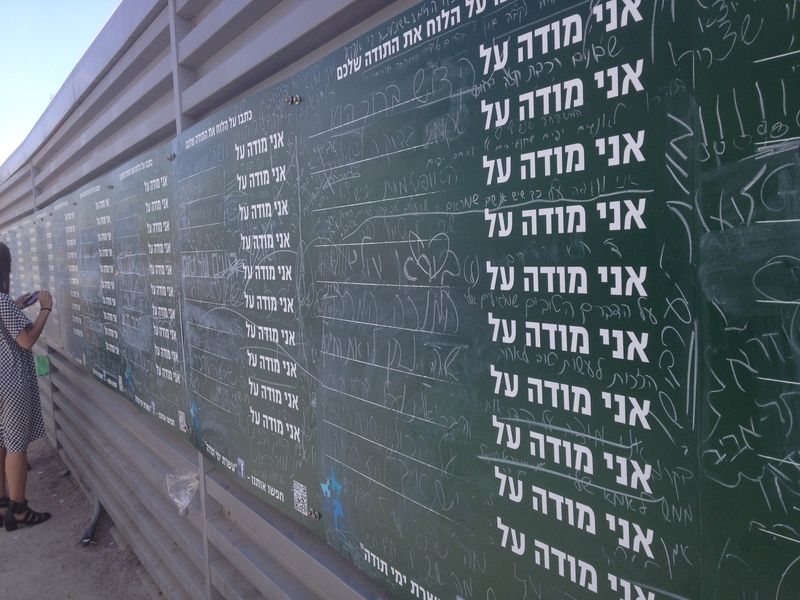 On a construction site across from Jerusalem’s Central bus station there is a chalkboard running the length of the corrugated metal barrier that surrounds the site. Printed on the chalkboard numerous times in rows and columns are the words “Ani Modeh Al” (“I am thankful for”) with a blank line next to it for passers by to fill in. Not only is this a great use of space, but a wonderful form of communal self-expression. The headline on the top of the board reads “Write Your Thanks on the Board.” At the bottom is a QR code and a call to find the Ten Days of Thanks on Facebook. As Israel has just turned 66 years old, we all have much to be thankful for. More than one person expressed their thanks to the workers of the municipal water company who worked through the night to restore our water supply. In this age of mass communication and social media, don’t keep your appreciation to yourself. Let others know, what are you thankful for. Share your gratitude with others and appreciate all that you have. This entry was posted in Home in Jerusalem, Published in The Jewish Community Voice of Southern NJ and tagged Independence Day, language, media, Photos on May 13, 2014 by charlie.